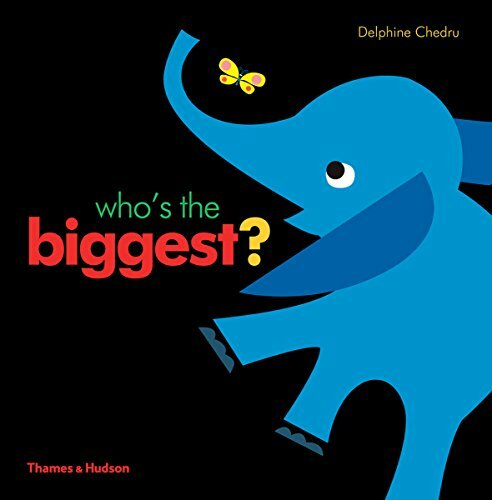 a book review by Cindy Helms: Who's the Biggest? Clean graphics and a fun twist mark this preschool picture book. French graphic designer Chedru asks one simple question from page to page which is, as in the title, Who’s the Biggest? The consistent format follows through from the very first page with black background livening up the white lettering announcing, “I am!” on each left-hand spread. The illustrations on the right indicate which of the pairing is actually the subject of each answer. An adorable blue elephant is the obvious answer compared with a small yellow butterfly. A massive thick tree is, of course, bigger than a squirrel. A bear is larger than a honey pot, but, a few pages later, the bear is dwarfed by a massive mountain. While most pairings are animal and nature oriented, a few are more mechanical. A hammer is bigger than a nail, a pan is bigger than a grain of rice, and an umbrella is bigger than a raindrop. Each simple color and shape combination has a corresponding lively and interesting illustration. There isn’t necessarily a story that keeps the pages turning, instead there is a sense of something different about to happen. Chedru plays with adjectives and personal pronouns sometimes slipping in a “me and mine” among the “the’s” making the reader feel that this book is really about them. Objects transition from being “the butterfly,” “the squirrel,” and “the honey pot” to being a possessive “my goldfish,” or “my ball.” This shift sets up the finale that culminates in a personal experience for the reader. Another aspect of Chendru’s clever project is the use of descriptive words. She treats her audience with intelligence and sophistication by incorporating wonderful vocabulary words not always seen in such simple books with limited word counts. The elephant doesn’t just say “I am!” the biggest, she “trumpets” her answer. Likewise the tree “whispers”, the bear “grunts” to the smaller honey pot as the mountain “murmurs” to the bear, the hammer “warns” the nail, and the pan “hums” to the rice. These word choices energize the pages just as much as the color contrasts do. Young children are likely to connect with this book on several levels. At a minimum they will build connections with and between the multitude of objects in everyday life; they will begin to share in the pleasure of the reading process by answering “I am” in repetition while building a rich vocabulary along the way; and they will become empowered by the final twist. All of which are pretty surprising results from the simple question of, Who’s the Biggest?